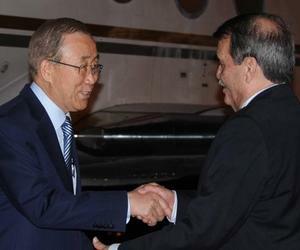 The Secreatry-General of the United Nations Ban Ki Moon arrived in Havana on Wednesday night to attend the signing of a final ceasefire accord between the Colombian government and the FARC-EP guerrilla. Ki Moon arrived accompanied by the President of the UN General Assembly Mogens Lykketoft and the President of the UN Security Council Francois Delattre. The United Nations is playing a pivotal role in the monitoring and verification of the agreement between the parties involved in the longest armed conflict in the Americas that includes the issue of disarmament and sets the guarantees of safety and the fight against criminal organizations responsible for genocide in Colombia.